What is a Monte Carlo analysis? What is Monte Carlo sampling? How does a Monte Carlo simulation work? Monte Carlo simulation (also known as the Monte Carlo Method) is a computer simulation technique that constructs probability distributions of the possible outcomes of the decisions you might choose to make. Creating the probability distributions of the outcomes allows the decision-maker to quantitatively assess the level of risk that comes with taking a particular decision and, as a result, select the decision that provides the best balance of benefit against risk. 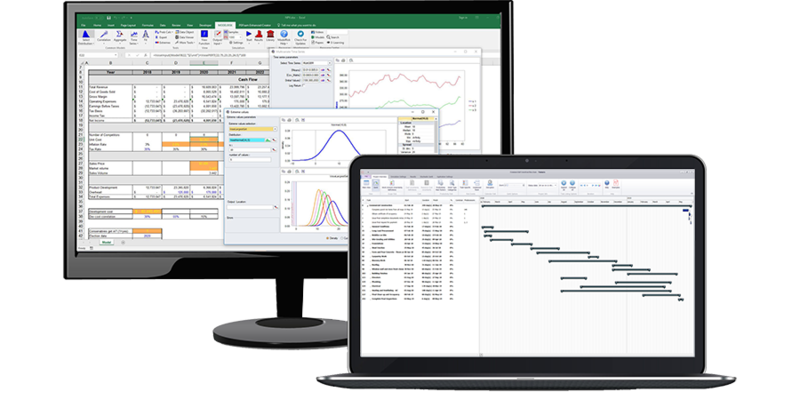 ModelRisk is the world’s most innovative and comprehensive risk analysis add-in for Excel using Monte Carlo simulation. Use ModelRisk to describe uncertainty in your budget, financial model, sales forecast, or any other area you use Excel for. The horizontal axis shows the possible amount of profit a venture may make, and the vertical axis states how likely those values are. In this example, the histogram shows that the most likely profit is a little under zero, with a possible loss of up to $1M or so, but a potential gain of $5-6M, or even higher (though with a very small probability). To perform a Monte Carlo simulation, you must first have a mathematical model, like a spreadsheet. The model will have one of more results of interest (called outputs) - like profit, NPV, cashflow, cost, sales volume, etc, The model will depend on a number of quantitative assumptions (called inputs) - like market size, macroeconomic factors, production capacity, etc. Then for given values of these inputs, the model determines the value of the outputs through a series of equations. The greatest weakness of such models is that we are almost always unsure what the value of the inputs will be and, as a result, we are unsure of the outputs. 1. They do not take account of the probability of a scenario. For example, if we could say that there was a 1% chance that each of the cost items was in the range of the minimum estimate then, assuming these costs were independent of each other, the chances of all lying around their minimum value would be 1% x 1% x ... x 1%, i..e 0.01^9 = 1 in a billion billion, a probability as to be meaningless. 3. They don't take account of the combinations of values that could constitute a scenario. For example, in the model above some costs could be towards their minima, others towards their maxima, and others around the best guess. With just these nine variables and three values per variable, one can construct 3^9, nearly 20,000 different combinations! The horizontal axis represents the possible value of the variable (the land purchase cost) and the vertical axis represents the probability of each value occurring. The Triangle distribution interprets the three input values with straight lines to form a triangular shape, hence its name. There are many different distribution types used in risk analysis. The most common are: Triangle, PERT, binomial, Poisson, Normal, Lognormal and Uniform distributions. However, depending on the subject of the model (e.g. stock prices, system reliability, epidemiology) the set of distributions used will be very different. ModelRisk includes essentially all probability distributions used in risk analysis. In a Monte Carlo simulation model, values that are uncertain are replaced by functions generating random samples from distributions chosen by the modeler. Then a simulation is run on that model, which amounts to recalculating the model many times, each time using different random values for all the uncertain variables, and storing the resultant values for each output of the model. At the end of the simulation run, the values for each output can be analyzed in various ways - graphs like the histogram above, and others, give pictorial representations of the shape and range of the uncertainty for each output. The output data can also be analyzed statistically to provide information like the probability of the output falling above (or below) some specific target value. By definition, a random value from a probability distribution is equally likely to be at any cumulative probability. Reversing that logic, we can generate a random number for the variable by sampling from a Uniform distribution between 0 and 1, and then use the cumulative curve to translate this into a sample value for the variable. In the illustration above, a random value of 0.53 from the Uniform(0,1) distribution translates into a value of 15.9 for the variable. It is because these generated scenarios are all just as likely as each other that we can simply make a histogram distribution or cumulative distribution from the generated output results, and the resultant distributions can be interpreted as approximations to the true theoretical distributions of the output variables. The more samples (sometimes called iterations) that are run in a simulation, the smoother the resultant distributions become and the more precisely they match the true theoretical result. In order to produce a high quality Monte Carlo simulation, one must have a method of generating Uniform(0,1) random numbers. Vose Software simulation products uses the Mersenne Twister., which is widely considered as the best all-round algorithm. The algorithm uses the generated value as an input to produce the next value. The random number generating algorithm starts with a seed value, and all subsequent random numbers that are generated will rely on this initial seed value. ModelRisk and Tamara both offer the possibility of specifying the seed value for a simulation, an integer from 1 to 2,147,483,647. . It is good practice always to use a seed value and to use the same numbers habitually (like 1, or your date of birth) as you will remember them in case you want to reproduce the same results exactly. Providing the model is not changed, and for ModelRisk that includes the position of the distributions in a spreadsheet model and therefore the order in which they are sampled, the same simulation results can be exactly repeated. More importantly, one or more distributions can be changed within the model and by running a second simulation one can look at the effect these changes have on the model's outputs. It is then certain that any observed change in the result is due to changes in the model and not a result of the randomness of the sampling. A very common question is how to determine how many samples to run in a Monte Carlo simulation, which is discussed here.